Rex would then construct the sentence as Baden handed him the letters he requested. They worked together until the sentence was finished. We did a few sentences this way and it was fun. Both boys could work on the skills they needed to - including cooperation. For a little more work with Baden I'll write all the letters on a page and then call them out. 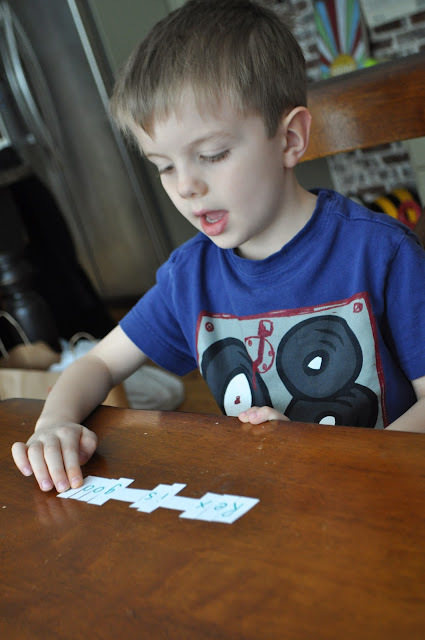 He has to find and cross out (or stamp) each letter that I call out. This helps with any letters he's shaky on. Then we do the lower case ones too. And that's mommy school for today. Thanks for stopping by. I think you found a good way to give every boy a good exercise. But I wonder why Kids at the age of 3 has to learn letters? Is that usuluar in the USA? Here in Germany Kids start school at the age of 6 and there they start to learn the letters and later, to read words and sentences. Here a child of 5 years isn´t able to read a sentence like Rex does. I think it is beginning to become the norm in the USA for kids that young to learn this type of information. I'm not sure how good it is either though. My 5 year old is still trying to cement all the letters into his brain (although he just turned 5 and is still in pre-school), definitely not up to Rex's level of writing sentences. He's a smart kid, but all this super early learning makes him feel inferior when he still just wants to play. Guess it just depends on the kid too. I love how you find something both kids can do and they work together. What great learning and great relationship building you are doing. What a lovely idea! And I love the look of concentration on Baden's face in the last pic! You are such a smart momma! This will be perfect for my little men! I LOVE those idea's. I have two 3 year olds I'll try that second idea with. Recently I cut papers about 4"x4", wrote one letter on each one, stuck them all randomly on a wall and gave the kiddo's a fly swatter. Then I would say a letter and they had to find the letter and swat it with the fly swatter. I liked this b/c it was a gross motor activity also! I did this activity with #'s too. Love it! Monday is my favorite day to check your blog. 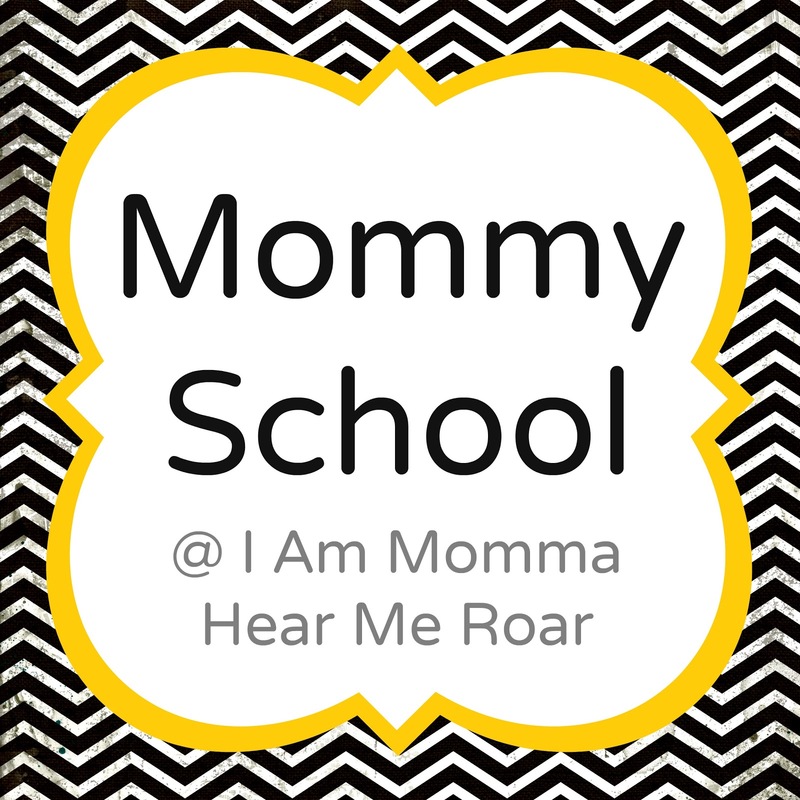 As a Kindergarten teacher I love this mommy school lesson! Aside from that I really love how you modified it to meet both your boys' needs at the same time. Very creative! I love your co-operative learning approach! My good friend teaches kindergarten here in Canada where she has both JR. and SR. children in the same class. It's an approach that encourages the co-operative learning between JR and SR students. A technique they have been using for the spaces is something that I think your boys might like. The letters are cut out as you did and they have a little graphic of a "space man" who stands in where spaces are needed. When my friend, or a student is spelling out words in a sentence, the class calls out "don't forget the space man" when a space is required. Cute! Such a great way to involve both boys where they are. I love that sentence idea. May borrow that for my only. 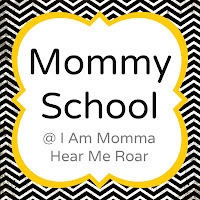 Oh mommy school makes my brain churn on how to apply for my daughter. Thanks for the ideas!